This photo is truly elegant from the tip of the woman's feathered hat, to the rich curled mouton fur jacket and extending to the sleek, neat lines of the dog. I love the alert poise of the dog, whose name is Clive! Clearly, he was the well loved companion of the woman and not a photographer's prop. The photo, unlike many contained a great deal of information. But it was written in ink with elaborate script that I found difficult, if not impossible to decipher. 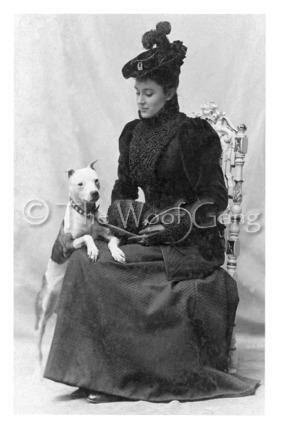 Then my husband looked at it and said, "it says that this is Alice Anderson and her dog Clive, Dubuque, Iowa 1900." And sure enough, once he said that, I too could read the writing! In this period of time, several breeds were undergoing evolution and development by breeders and the lines were not always clearly drawn. Clive looks most like a Staffordshire Terrier, the true British breed from which evolved the American Staffordshire Terrier and then the Pit Bull. If he is indeed a British Staffordshire, that might well explain the name of Clive which is decidedly British. Regardless of his breed he is every bit as lovely and elegant as his owner.